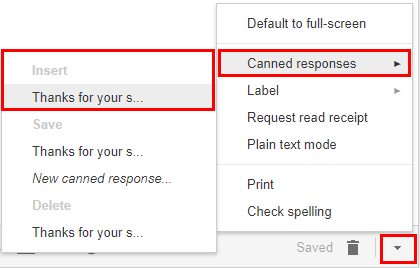 Gmail’s lab called Canned Responses lets you save pre-written email messages for later use. This is particularly helpful for sending frequent similar emails; you can load a canned response, make changes, and then send it without having to write the entire email from scratch or store these pre-written emails in a separate document on your computer. 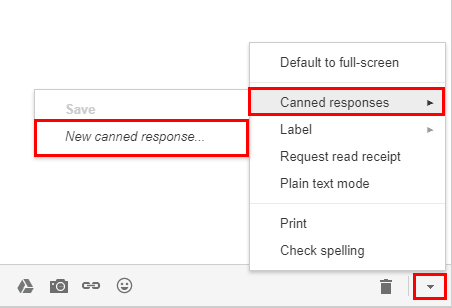 Before you can use canned responses, you must enable the Google Lab on Gmail. 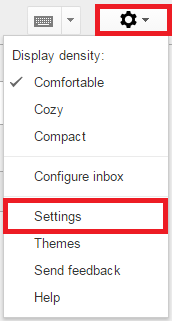 NOTE: You must be directly logged into a Gmail account to access the Labs tab. The Labs tab is unavailable with delegated or proxy access to the account. Find Canned Responses in the list, and then click Enable. Click Compose, and type in the message you would like to save as a canned response. Delete any email signatures from the window before continuing. Click the arrow at the bottom right of the window, roll over Canned responses, and then click New canned response. This will save the message as a canned response for future use. 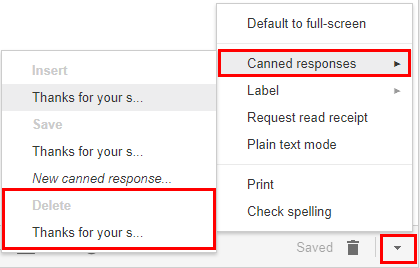 To overwrite a previously created canned response, click the title of the canned response. Click the arrow at the bottom right of the window, roll over Canned responses, and under Save, click the canned response you would like to insert. You may then click Send, or you may adjust the message before sending it. Click the arrow at the bottom right of the window, roll over Canned responses, and under Delete, click the canned response you would like to delete. Click OK to confirm.